Thousands of fans of Brazil’s Chapecoense soccer team have held a vigil in the city of Chapeco for the victims of a plane crash in Colombia. People walked from the town center to the stadium where they prayed and sang. A service was also held in Chapeco’s cathedral. The team was flying to Colombia for the biggest match in their history when their plane went down shortly before landing in Medellin on November 28. Brazil has declared three days of official mourning, while minute silences have been held at football grounds around the world. Some 10,000 people – including family members of the players – gathered in Chapeco’s Arena Conda stadium on November 29, still stunned by the news from earlier in the day. Fans wearing the club’s green and white colors sang the names of the players and shouted “champions”. Families of the players hugged each other on the pitch. Brazilians doctors have already flown to Colombia in order to identify the bodies, and arrange for them to be brought home. This could happen in the coming days, as the lack of a fire at the crash site has made retrieving and identifying the bodies of the 71 victims relatively easy, emergency workers say. 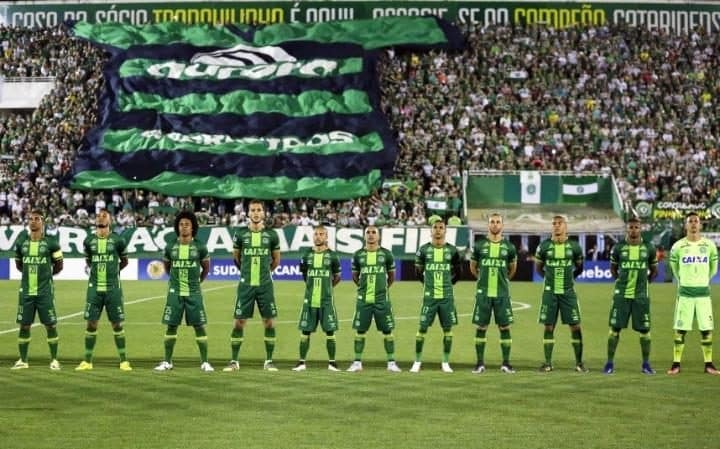 Chapecoense team was due to play in the final of the Copa Sudamericana against the Colombian team Atletico Nacional on November 30. Atletico Nacional has asked fans instead to come to the stadium dressed in white for a candlelit vigil. They have also offered to concede the game to ensure Chapecoense are declared the champions. In other tributes, Brazilian first division soccer teams have offered to lend players to Chapecoense free of charge for the 2017 season, and asked the league to protect the club from relegation for the next three years. Leading soccer players, from Barcelona stars Lionel Messi and Neymar, to Manchester United’s Wayne Rooney, have also paid tribute to the players. Alongside the soccer team, there were also 21 journalists on board the doomed flight – including well-known Brazilian commentator and former soccer player Mario Sergio Pontes de Paiva. Two crew members, Ximena Suarez and Erwin Tumiri, and journalist Rafael Valmorbida were also among the survivors. Hailing from a small city of less than 200,000 inhabitants, Chapecoense soccer club had become an unlikely success stories in recent years, reaching Brazil’s Serie A in 2014 and beating more established teams. Last week, Chapecoense became the first Brazilian team in three years to make it to the final of the Copa Sudamericana, South America’s second most important club competition, after beating Argentine side San Lorenzo.